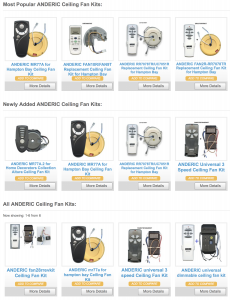 Hi everyone, if you need a new remote or a new receiver for your ceiling fan be sure to visit our website. Whether it is a Hampton Bay, Harbor Breeze, Home Decorators or Hunter fan, we have you covered at Replacement Remotes. Give us a call toll free at 1-855-573-6683 and one of our knowledgeable representatives will be glad to help you. We are also still running the popular FREE shipping over 20 dollars or more as well!